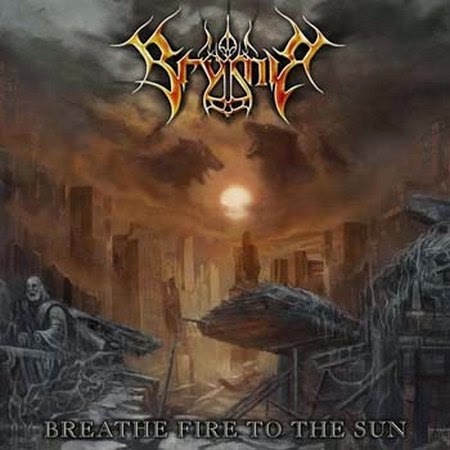 A stunning debut from Finland's Brymir, Breathe Fire To The Sun is epic symphonic death metal, filled with highly sophisticated metal forged in the darkest recesses of Scandinavian winters. Brymir sound like a veteran band that has been together for years, their complex compositions suggesting a maturity far beyond what could be expected on a debut. With an average track length of about 6 minutes, deep symphonic elements courtesy of Janne Bjorkroth's keyboards are combined with the massive drums of Sami Hanninen to create grand mid-tempo melodies, the vocals mostly a deep, background-mixed controlled growl with the very rare clean passage. The guitar solos may be missing, but Brymir don't go looking for them. The production quality is excellent, the sound deep and crystal clear thanks to Lari Takala's expansive mix, which brings out the grandeur of the band's sound. The moody, dreamy Intro drifts into the magnificent Unconquerable, a dazzling celebration of metal most heroic, the keyboards creating an imposing arch doom over the track. In Silence is even more ambitious, a sad melody carried by booming drums into glorious battle, flags shredded by the carnage. Cycle Of Flame is a rousing theme of destruction, a simple melody upon which Brymir construct a burning, staccato-inspired battle anthem. But the album reaches its peak on Retribution, a most perfect nugget of metal most pure driven by that unfairly glorious combination of keyboards and drums before the guitars of Sean Haslam and Joona Bjorkroth take over the reigns to deliver salvation most soothing. Withering Past ups the pace while Ragnarok offers a nimble tune filled with energy; both add substantial depth to the album. A stand-out achievement, Breathe Fire To The Sun generates solar heat with an imperious air. Recorded, Mixed and Engineered by Lari Takala.